Good for what ails you…home-styled comfort for a rough day or a cold night. Around here the leaves have turned and fallen, the wind is cold and blustery outside, the fat bird has sung its Thanksgiving song and all that remains are the memories…and few extra pounds, perhaps! It’s a fun time of year, but a stressful one. The weather keeps changing, the baking and gift giving frenzy is upon us, and with all of that can come an unwelcome cold or case of the flu, or maybe just a touch of the holiday blues. Fear not, dear ones, I have just the thing for you! My Cure-All Chicken Noodle Soup is simple and simply comforting. It’s the thing to have after all the stuffing and overstuffing of the Thanksgiving holiday, and to recover with before the next round of partying and eating. Over the years I’ve found that is has the power to not only ward-off oncoming illness, but to surely make anyone with the sniffles or blues feel warm and loved. Even the steam off the bowl is good for clearing your sinuses! Additionally, this bowl of goodness will take the edge off of your hectic day and remind you of cozy comforters and a warm fire in the fireplace. Granted, in some cases it may not replace antibiotics in terms of a cure-all, but it sure can’t hurt! This soup is wonderful accompanied by a slice of cheese toast. And if you feel so inclined to gild the lily, you can add a few drops of fresh lemon juice and a small bit of sour cream to your bowl to mix in for a little extra comfort and joy. Mmmm, mmm, good! Allow the soup to simmer until the mushrooms are done, about 5-8 minutes. Serve in bowls and enjoy! This entry was posted in Food, Soups and tagged Chicken, chicken noodle soup, chicken soup, comfort food, Cure for a cold, egg noodles, homemade soup, soup by bitsandbreadcrumbs. Bookmark the permalink. Something SO comforting about chicken noodle soup – yours looks heavenly. Thank you, Mandy! 🙂 It’s a very homestyle version of a classic. Great recipe to have in advance of cold and flu season! It does the trick to lift your spirits and nourish the soul…or at least helps! Thanks, Yummy! I could really use a bowl of that soup right now Betsy! This is day #3 of my cold. Great idea to do a post on something soothing for such a hectic time of year. I like the addition of mushrooms to your soup. Hi Barb, and I’m so sorry to hear you have a cold! I made this to take to my mom’s at Thanksgiving…she had a cold and I like to think this soup helped! 🙂 Wish I could send some your way… sure hope you feel better soon. I just made one on Sunday, because yes indeed, I came down with a doozy! I never put the skin in my soup because I usually don’t have time to let it cool to skim off the fat, even though I know it adds flavour. I usually throw in a 1/4 of a fresh lemon. One thing for sure with either version, you can bet there is NEVER enough! It is cooooold out (snowed yesterday) and I sure could use a huge bowl of your soup. 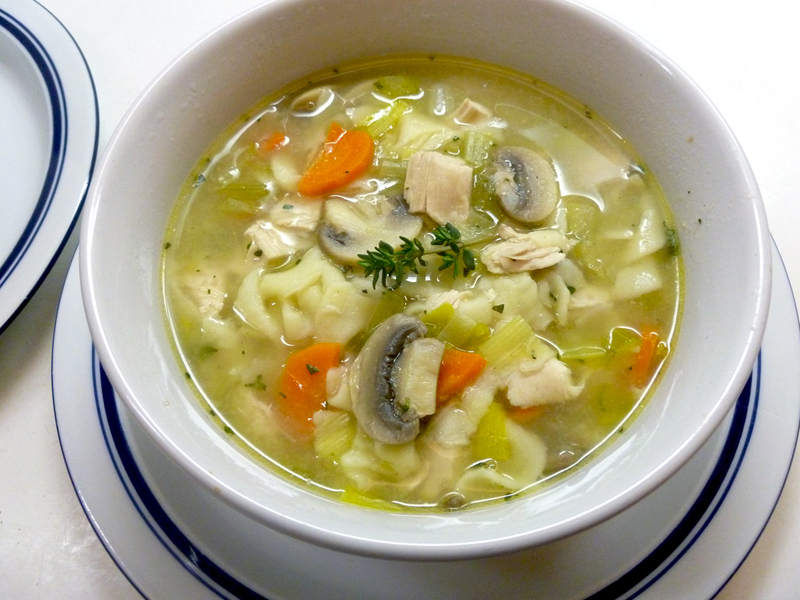 A homemade soup is especially nice at this time of the year…chicken noodle is a favorite. Thanks Karen, I definitely get on a soup kick this time of year! Me too Betsy, we had soup tonight. Chicken noodle soup is a fabulous soup for a pick-me-up. When I was still working and felt a cold coming on, I’d stop at a grocery on the way home and start a pot of soup. As the cold ran its course, I sipped on broth, at times, and ate chicken noodle soup, at others. There’s nothing like a warm bowl of chicken noodle on a chilly day, Betsy. All that’s missing in your opening photo is the aroma. It looks delicious! I do wish we had an aroma feature on WP, wouldn’t that be great…or interesting at least! 🙂 Thanks for your lovely comment, John. Chicken soup always makes me feel good, or better if I wasn’t feeling well already. And it’s one of those great soups for which everyone has their own version. Your soup makes me feel better already! 🙂 My mother made a wonderful chicken soup that I’ve never quite managed but it looked a lot like yours. Maybe this is my new soup! Oh I hope so, Maureen! It is such a homey thing, isn’t it? This one is easy, too. 🙂 Thank you! oh yes… any thing soupy and noodle-y catches my attention. I need this now. I feel a cold coming. Yes, you definitely need some of this if you feel a cold coming on, Jayne! Thanks for visiting and for your comment. Wish I could send you some soup! Yup the colds and flus are going around and there is nothing better to get your insides back to normal than a hearty bowl of chicken soup. I can taste the deliciousness in that image Betsy! Betsy I need this soup. I’ve been sick for two weeks! Hope you’re enjoying the season, hugs! Oh Karista, I really wish I could send you some. I actually took some of this soup to my mom in AL over the holiday…she had a cold and it helped! She was well by the time we left…I’d like to think the soup helped a teensy bit! 😉 Hugs to you, too, and get well very soon, you hear? Love, love, love homemade soups! This sounds fantastic. I froze my turkey stock after boiling up the bones after Thanksgiving because I didn’t have time to use it, and I can’t wait! Hi Gretchen! I think this recipe would make a great turkey soup, too…perhaps subbing a little splash of sherry for some of the wine. Whatever you make, I’m sure it will be great with all of that homemade stock! Oh, good thought on the sherry. I guess I need to stop by the licquer store – darn! Actually that reminds me that we are out of sherry, too! 😉 Have a super weekend. Am in perfect health (thank goodness) but I would still enjoy a huge bowl of this. Please….! So glad you’re feeling good and I’ll bet you’re tired after so much renovation going on. Wish I could send some of this soup your way! Love the addition of wine and mushrooms to your already lusciously healthy soup! Wonderful! No virus would dare to mess with it! Hi Claire! Thank you so much for stopping by and letting me know that my post prompted you to make this soup…so nice of you to do that! 🙂 I actually froze some of ours, which I haven’t done before and we haven’t thawed it yet, so I can’t tell you if that works well or not. But I can’t imagine it would hurt it…the noodles may get a little mushy, though. Hope you have a great weekend! That’s a bowl of comfort! I could really use a bowl of that luscious, gorgeously golden soup right now. Chicken soup is the best for whatever ails you for sure…if even if nothing ails you! 🙂 Please take care and enjoy the week Betsy. Thanks so much, Geni! Wish I could send you some soup. 🙂 Hope you have a great week, too!